Scale is not about being big or small. At different scales, different relationships matter. Scale is a way of describing which processes are dominant and meaningful within certain sites. For example, looking at a skin cell under a microscope, you would notice cell division and nutrient circulation. These are the processes that matter. You wouldn’t see gravity at work, even though it is technically present, because capillary action (pressure and movement from water) is dominant at the scale of the cell. When you “zoom out” and look at the surface of someone’s skin with your eyes, you would notice goose bumps, scars and skin colour, none of which were apparent under the microscope and all of which have entirely different social and medical connotations. There are actually different things at different scales. You just don’t scale up and get something bigger or scale down to get something smaller; you get something else entirely (Sayre 2005, 2009). This is the crux of scale, and why it matters as an analytical framework for thinking about how things work. Page from “As the World Burns: 50 Simple Things You Can Do to Stay in Denial-A Graphic Novel” by Derrick Jensen, Stephanie McMillan, Seven Stories Press, 2011. Different kinds of waste occur at different scales. Household waste is different than municipal solid waste, which is different than industrial solid waste. It’s not just that these types of trash are made up of different things, which is certainly the case, but that they had different sources, hazards, environmental burdens, modes of accountability, and loci for change. Different processes matter. When most people think of waste, they think of household waste–their own waste. Sometimes they think of municipal solid waste–all the waste produced in their city or town. But this accounts for very little of waste in general. Making changes at the household or municipal level affects things like personal ethics, tipping fees at landfills, and maybe local economics, but they don’t tend to affect the environment writ large, or the problem of waste in general. 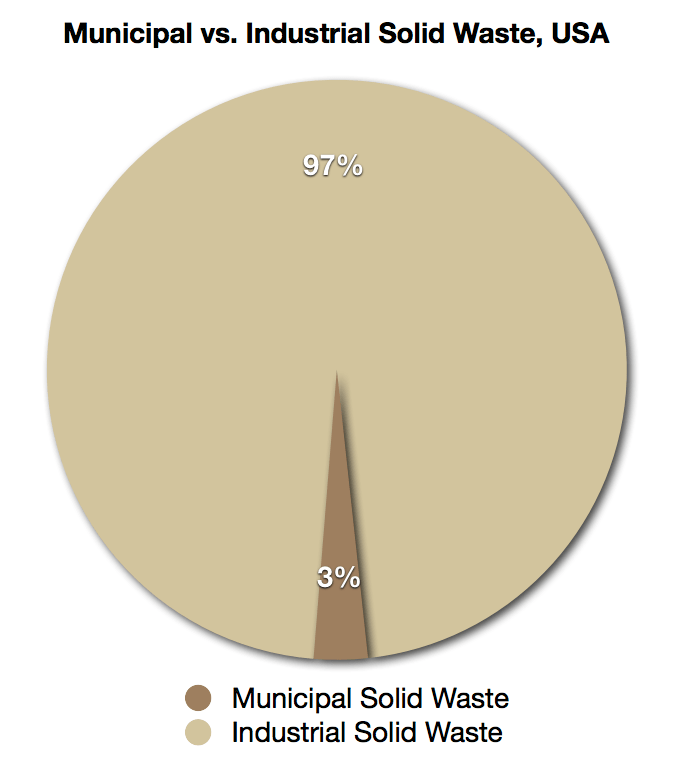 This is because the vast majority of waste is industrial solid waste. Chart by the author, based on figures from MacBride 2012, Royt 2007, EPA 1987. Pre-consumer food waste consistently outranks consumer waste, regardless of country. 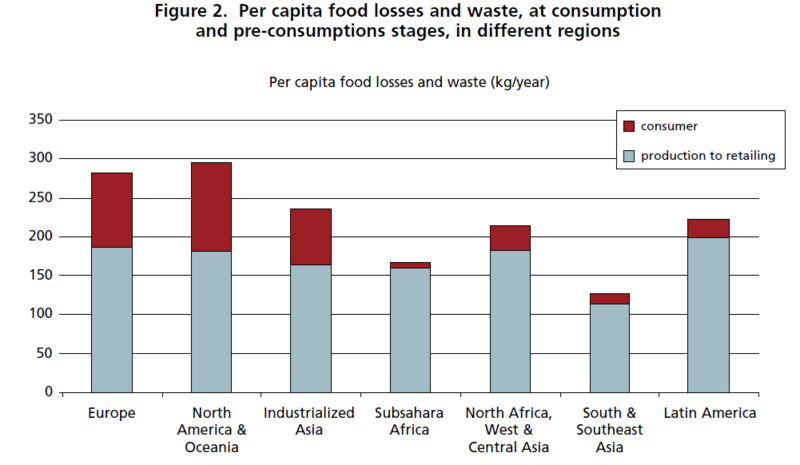 Graph from The United Nations Food and Agriculture Organization. Thus, the process that matter for impacting waste writ large are industrial, pre-consumer processes. A whole lot of waste is something different than the everyday encounters with waste in your home or office. There is a small but increasing critique of scale within environmentalism that aims to call attention to the disproportionate scale of some polluters or wasters over the ones usually targeted for change. Most recently, The Guardian put together an interactive graphic about where the majority of green house gases are coming from. It turns out that just 90 companies caused two-thirds of human-made global warming emissions, including Chevron, Exxon and BP. Screenshot of interactive data visualization from the Guardian. Graphic by Duncan Clark and Kiln, drawing on work by Mike Bostock and Jason Davies. Click on image for link to interactive project. A Discard Studies reader sent us the infographic below and asked for our interpretation. The graphic includes a mishmash of scales, some of which match problem and solution, and many of which do not. “Hungry Planet: Consumption Around the Globe.” Graphic from International Business Degree Guide. The number one problem with this infographic is the nearly exclusive use of per person, or per capita, measurements. Per capita waste statistics are created by dividing the total weight of waste by the population of a given area, and give the impression that individuals are the main agents of waste, and that wasting is distributed more or less equally among them. Moreover, because the infographic focuses on municipal solid waste, developed countries will always come out ahead because there really are no statistics for most countries in the global south, many of whom do not have centralized urban solid waste services. But most importantly, returning to the breakdown of household and municipal solid waste compared to industrial solid waste, the amount of waste an individual person produces doesn’t matter a bit against the massive production of industrial solid waste, which tends to be more hazardous, more toxic, and better hidden from public view. If scale is about what processes matter, then the infographic has missed its scale. Per capita measurements of trash obfuscates the main agent of waste– even within municipal solid waste, which can contain commercial and construction & demolition waste. By interpolating individuals as agents of waste, per capita measurements politicize measurement in the interest of industry by reproducing the myth of the wasteful human rather than calling out how humans in our society have become an inextricable part of a an industrial infrastructure of disposables and waste, lead by industrialized countries such as the United States. This is a classic unintentional mismatch of the scale of the problem and the scale of the solution. Environmental harms involve a “double diversion”- two forms of privilege that deserve greater attention. The first involves disproportionality, or the privileged diversion of rights/resources: Contrary to common assumptions, much environmental damage is not economically necessary-” instead, it represents privileged access to the environment. It is made possible in part by the second diversion – the diversion of attention, or distraction– largely through taken-for-granted or privileged accounts, which are rarely questioned, even in leftist critiques. Data show that, rather than producing advanced materials, major polluters tend to be inefficient producers of low-value commodities, and rather than being major employers, they can have emissions-to-jobs ratios a thousand times worse than the economy as a whole. Instead of simply focusing on overall/average levels of environmental problems, sociologists also need to examine disproportionalities, analyzing the socially structured nature of environmental and discursive privileges. Doing so can offer important opportunities for insights, not just about nature, but also about the nature of power, and about the power of the naturalized. One of these “diversions of distraction” that enables the privileged access to resources (in this case, using natural resources as sinks for pollution and waste) is a discourse that consistently mismatches the scale of the problem with the scale of solutions, or just plain describes the scale of the problem incorrectly. This is not always intentional– we are in a culture of scalar mismatches, where “10 small things you can do to save the planet” are offered, and followed, as a matter of course, and where Freudenburg’s “privilege” is largely invisible. How can we possibly know the scale of industrial waste and pollution when most of it occurs behind fences on private property, or in countries beyond our own? In human geography, the naturalization of scalar mismatches in cultural discourse is called scale-fixing. It is considered a technique of power. The infographic is (probably) unintentionally scale-fixing by defining problems at the wrong scale, with processes that don’t matter to global waste. Erik Swyngedouw explains, “[h]egemony, then, can be defined as the capacity of a dominant group (or an alliance of class factions) to impose a series of social practices at a particular spatial scale that are to its (their) advantage” (147). The naturalization of per capita measurements is an example. The infographic has some points that are not mismatched, though. The global measurements that provide the statistic that it would take 1.5 earths to provide resources and absorb waste currently produced is a good way to point to privilege if the numbers are broken down well. Comparing total statistics for countries, rather than per capita breakdowns, also provides insight into how industries and politics work. And the comparison of energy sources shows an acute lack of renewables the world over, and points to where the next nuclear disaster is likely to strike. Overall, measurements are never faithful representations of nature, but have social and political origins and ramifications. Paired with a cultural tendency to see individuals as the main units of social change and the overuse of per capita measurements, the politics of scalar mismatches occur as a matter of course despite the usually excellent intentions of their authors. Thus, we need a shift in cultural discourses that include proportion and scale so that information, problem identification, and proposed solutions are able to intervene into problem processes in meaningful and effective ways. Jensen, D., & McMillan, S. (2011). 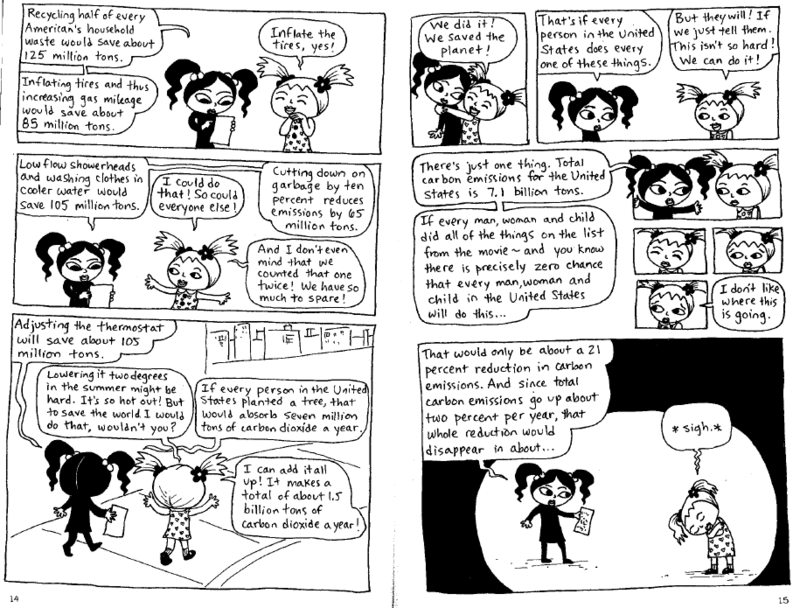 As the World Burns: 50 Simple Things You Can Do to Stay in Denial-A Graphic Novel. Seven Stories Press. Sayre, N. F. (2005). Ecological and geographical scale: parallels and potential for integration. Progress in Human Geography, 29(3), 276-290. Sayre, N. F. (2009). Scale. A companion to environmental geography, 95-108. Smith, N. (2004). “Scale bending and the fate of the national,” in Sheppard E and McMaster R B eds. Scale and geographic inquiry, Blackwell, Malden, MA: 192–212. Swyngedouw, E. (1997). Neither global nor local:‘glocalization’ and the politics of scale. Spaces of globalization: Reasserting the power of the local. This entry was posted in Activism, Consumption, Environment, Government, Methods, Waste and tagged Municipal solid waste, scale. Bookmark the permalink.